Awesome! This will undoubtedly inspire people all over America to serve their country. To publicize the new slogan, the Army has released a new ad in which a uniformed soldier stands on top of a mountain and shouts, “Ding dong! Ding dong! 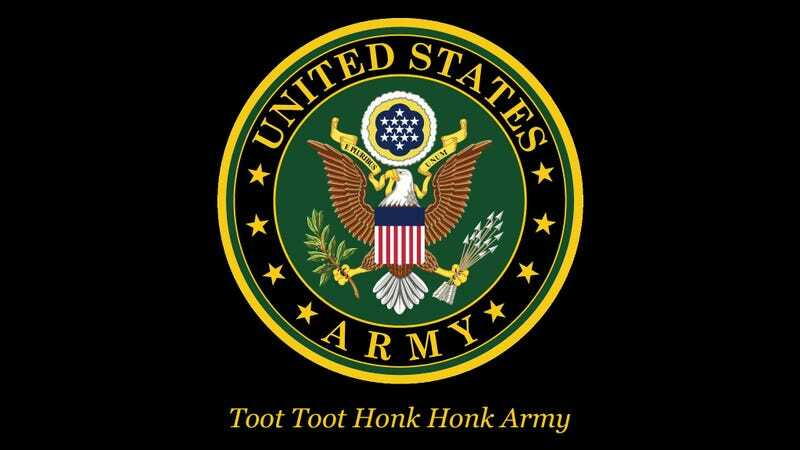 Ding dong!” The Army logo then appears above the words “Toot toot honk honk army.” Army officials are hopeful that the ad will convey to young Americans that the Army is a wonderful place to yell “honk honk” and “toot toot,” and that their commitment to making a noise like “ding dong ding dong” is unparalleled anywhere in the world. Pretty impressive! With a slogan like “Toot toot honk honk army,” the United States has proven once again that it has the most advanced military in the world. When America’s foes try to threaten our way of life, our brave soldiers will say “toot toot” and “honk honk,” and then they will bonk the enemies of freedom on the head. Don’t be surprised if you see a ton of new recruits excited to honk and toot over the next few days!